Home » Wack or Whack – Which is Correct? Homophones are words that sound alike but have different meanings. These types of words are common in English and have been a source of confusion for writers since time immemorial. Whack and wack are homophones, but it might surprise you to learn that their meanings are so different that they are not even the same part of speech. What is the Difference Between Wack and Whack? In this post, I will compare wack vs. whack. I will use these words in several example sentences, so that you will see how they appear in their proper context. I will also describe a mnemonic device that makes choosing wack or whack easier for your own writing. What does whack mean? Whack can be a noun or a verb. As a verb, it means to hit something. As a noun, it means a solid hit. A baseball player might whack a home run, or a schoolmarm might land a sharp whack on the back of a student’s hand with a ruler. “If you don’t stop complaining and eat your vegetables, I will whack you upside the head so hard you’ll wish you’d never seen a vegetable!” threatened George’s mother. One way to get ripe fruit from a tree is to whack its limbs with a long stick until the fruit falls to the ground. The Dodgers lost the game in the bottom of the 9th inning when an opposing player lined a short whack down the right field line, scoring two runs. “A whack on the head makes any young boy behave himself!” sister Christine advised sister Evangeline. Out of whack: Whack is also found in the phrase to be out of whack, which means something is out of order or not working. What does wack mean? Wack is a homophone of whack, but the similarities end there. Wack is an adjective that means bad, stupid, or unusual that originated in the hip-hop slang of the 1980s. Wack is flagged by spellcheckers, but the definition above appears in both Merriam-Webster and Oxford, the latter of which includes another definition that is chiefly British. Merriam-Webster alleges that the word is probably an alternate form of the adjective wacky, which also means weird or unusual. This sense of wack is not yet considered formal English, but its increasingly pervasive use since 1980 (during which time its appearance in English books more than doubled) means that it may eventually become an accepted term. Whack is a noun and a verb, so if you are using the word as those parts of speech, it is the clear choice. Wack is an adjective, but it is not yet widely accepted as a legitimate English word. It would be best to avoid using wack in formal settings, like academic and professional writing. 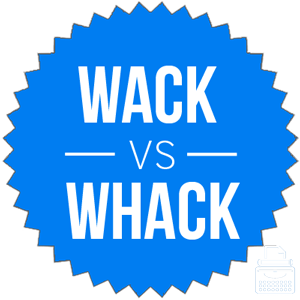 Whack vs. Wack Check: Since whack contains the letter H and is a synonym of the word hit, you should have little trouble remembering to use the word this way. Is it whack or wack? While these words are homophones, they are different parts of speech. Additionally, one is slang and should be avoided in formal writing. Whack is a noun and a verb that means a hit and to hit, respectively. Wack is a slang adjective that means unusual or bad. Avoid using wack in formal writing. 1 What is the Difference Between Wack and Whack? Weaved or Woven – Which is Correct?